If you're a lover of old movies, and even if you aren't, but Jack Russells as famous dogs of Hollywood might interest you, then I can't recommend enough the fabulous list of classic movies that feature Jack Russell Terriers. The Thin Man Series which features the handsome William Powell as a crime-solving sleuthe, and his meddling wife, Myrna Loy, who is always including herself as co-detective in every great adventure, are eclipsed by a wire haired Jack Russell called Asta. 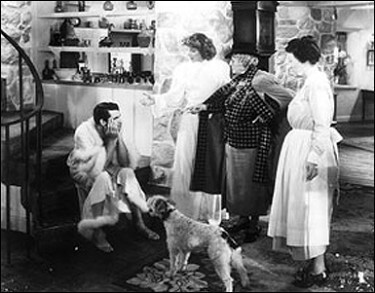 I've seen most of The Thin Man movies and could watch them over and over again. They just don't make movies like this anymore. Introducing your children to these classic filns always surprises them with how great they really are. Just try it on them and see. You'll be surprised how much you love them too. The movie clip above is another great scene from Bringing Up Baby starring Cary Grant and Katherine Hepburn. The dog you see is also Asta (whose real name was Skippy), but in this film was named George...one of the most famous dogs of classic Hollywood. Bringing Up Baby is one of my all time favorites. I've seen it a thousand times and still I find new things in it that absolutely crack me up. And George is outstanding. Look for the really neat scene where he wrestles with a real live leopard! 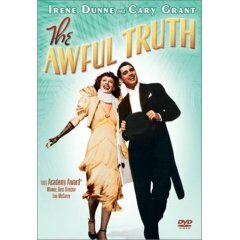 The Awful Truth again with Cary Grant but co-starring Irene Dunne also features our famous dog 'Asta-George-Skippy' but his name in this feature film is Mr. Smith. "Before their divorce becomes final, Jerry and Lucy Warriner both do their best to ruin each other's plans for remarriage, Jerry to haughty socialite Molly Lamont, she to oil-rich bumpkin Daniel Leeson. Among their strategies: Jerry's court-decreed visitation rights with Mr. Smith, their pet fox terrier, and Lucy's flamboyant impersonation of Jerry's brassy "sister" before his prospective bride's scandalized family." This movie is hilarious and one of Skippy's best. 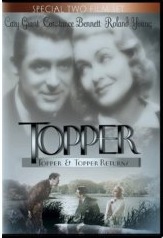 Then there is the 1937's comedy Topper & Topper Returns series as seen to the left, starring Cary Grant and Constance Bennett...and again co-starring Mr. Atlas, or better known as Asta-George-Mr. Smith--Skippy, the same wire-haired Jack Russell as in the above movies. Topper & Topper Returns "The fun loving Kerbys, stockholders in the bank of which henpecked, stuffy Cosmo Topper is president, drive recklessly once too often and become ghosts. In limbo because they've never done either good or bad deeds, they decide to try a good one now: rehabilitating Topper. Lovely, flirtatious Marion takes a keen personal interest in the job. Will Topper survive the wrath of jealous ghost George? Will Mrs. Topper find that a scandalous husband isn't all bad?" Mr. Atlas is in that car wreck with the Kerbys and also becomes a ghost who adds many a laugh to this great film. And please, consider getting these famous dog movies for not just your kid's enjoyment, but your own pleasure as well. I promise they will be a joy to you for years to come because their rich story lines, humor, and engaging plot content is like nothing you see in today's movies... that usually disregard the diminishing innocence of our beloved children, who love, by nature the simple things of life, like dogs...like Jack Russells, the most famous dogs of Hollywood!